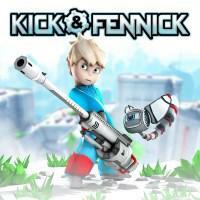 A sidescrolling platformer a boy (Kick) and his robot buddy (Fennick). You play as the boy using a large gun both to shoot enemy robots and to navigate levels by throwing yourself around with the gun’s recoil. This central mechanic is promising but doesn’t seem to go anywhere interesting (and was almost certainly done better in No Time to Explain ). The visuals and sound are fine but the game feels oddly unpolished - expository scenes are short and lifeless, the original Vita version has unnecessary reliance on the touchscreen that made me think the game was adapted from mobile, and the difficulty curve is nonsensical. The first hour is so simple and easy that I concluded the game was aimed at children (a conclusion supported by the bright colors, sparse story, child protagonist, and cute robot buddy) and then suddenly things got much, much harder, with incredibly precise jump arcs required in deadly areas. This would still be manageable, since there’s a teleport-you-back-to-solid-ground-when-you-would-die mechanic, but it has limited use and when it runs out you’re ejected from the level and have to restart. The game was no longer easy enough to be mellow but still not interesting enough to make it worth putting up with the punishment, so I put it down. I Stopped Playing When: After the first hour, the game got much more demanding without being sufficiently interesting.